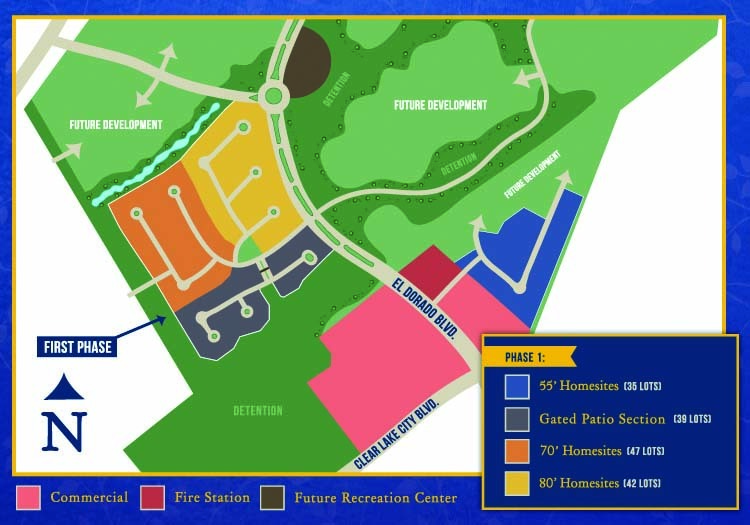 As Trendmaker Homes begins building the Reserve at Clear Lake City, the new 375-acre development just northeast of the 50-year-old Clear Lake City community, Houston City Councilman Dave Martin has been working with the developers to find answers to local residents concerns. Among them are worries about traffic, retail signage, storm water runoff and detention and other considerations as the 700-homes – both patio homes and large estates — and a nearby shopping center begin going up. The development will include swimming pools, parks, walking and jogging trails and a dog park, the developers said when the project was first announced. Martin sought to soothe his constituents’ angst by holding a public town hall meeting in November at Brookwood Elementary School in Clear Lake – a meeting attended by more than 300 residents of adjoining neighborhoods. During the meeting, Fidelis CEO Alan Hassenflu and Chief Marketing Officer Lynn Davis outlined plans for the commercial portion of the new community and then responded to questions and concerns voiced about the proposed development. “Topics included potential traffic impacts, the layout of the development and the signage planned by retailers in the commercial segment of the community and additional considerations,” Martin said. Many residents, for example, felt one sign proposed for a grocery story was too large and the developers promised to ask the grocery retailer, HEB, to downsize it to fit in with the rest of the community, he explained. They did and HEB agreed to cut the size of the sign in half. In conjunction with the construction, the Houston Public Works and Engineering Department have been replacing all existing traffic signal poles with 40-foot mast arms, revising the intersection signal timing based on current traffic patterns and making improvements to intersection sidewalks and wheelchair ramps. Additionally, Martin said, the left turn bay on Clear Lake City northbound will be extended nearly 300 feet to accommodate existing traffic. The city has already had LIA Engineering make a Traffic Impact Analysis, which generated traffic flow projections for peak hours following the full build out of all sections of the residential and commercial developments at Clear Lake City and El Dorado Boulevards – addressing all major intersections within a mile of the proposed development.